China's President Xi Jinping has called for the country's universities to become ideological "strongholds" of the Communist Party, the latest move in a crackdown on academic freedom. 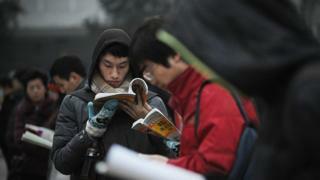 The universities must "serve the rule of the Chinese Communist Party" and "promote socialism", Mr Xi said. They must also integrate "ideological work" throughout the entire process of education, he said. Beijing has cracked down on free speech since Mr Xi became leader in 2012. Chinese authorities have been accused of detaining and jailing human rights activists, lawyers, and journalists. Although no new legislation has been introduced, the leader's pronouncements direct policy within the party and other institutions. Mr Xi now appears to be exerting greater control over educational institutions, raising fears over a further curtailing of academic freedoms. According to state news agency Xinhua, Mr Xi told a party meeting on ideology in education that universities are "under the leadership of the Communist Party, and are socialist colleges with Chinese characteristics, so higher education must be guided by Marxism". He said: "Adherence to the Party's leadership is essential to the development of higher education in the country", adding that China should "build universities into strongholds that adhere to Party leadership". China has long enforced political education classes at universities, but a number of professors complained earlier this year that students were being "brainwashed by Western theories". The state-run People's Daily newspaper printed Mr Xi's speech in full on its front-page on Friday, alongside a front-page editorial urging party members to direct university ideology. China passed a controversial internet security bill in November that banned internet users from publishing anything that damages "national honour", "disturbs economic or social order" or is aimed at "overthrowing the socialist system".